On Tuesday 14th August 7.30pm – 8.30pm, come to Lambeth Women’s Project for a screening of the trailer of the film Hip Hop Hijabis. Filmmaker Mette Reitzel will be in conversation about her film about the hip hop and spoken word duo Poetic Pilgrimage. Come join the discussion! Please note that cooking and sewing activities will not be taking place next week due to summer holidays. 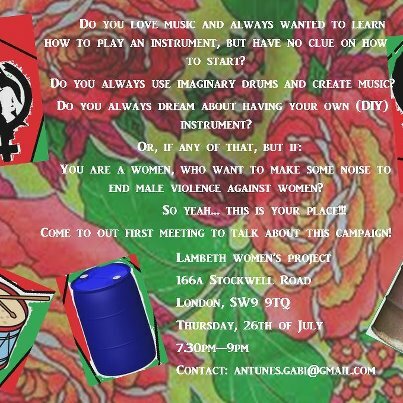 The Lambeth Women’s Project address is 166a Stockwell Road, London SW9 9TQ. The ground floor (where the above activities will take place) has full disabled access. Another fundraiser! 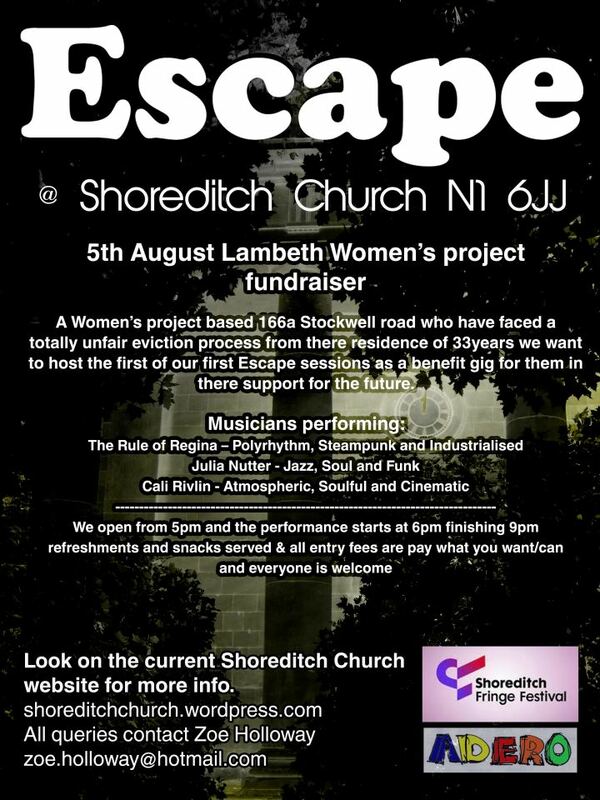 On Sunday, 5th August, The Shoreditch Church will host ‘Escape’. Rule of Regina, Julia Nutter and Cali Rivlin will perform. Doors open at 5pm, performances start at 6. Refreshments and snacks served. Entry fee is pay what you want/can and everyone is welcome. This Wednesday evening, 1 August, the ‘SOAS Nightmarket’ will be raising money for Lambeth Women’s Project. Come along and swap some clothes, listen to music and eat cake! Doing your dissertation but you just wanna dance? Bored of all your clothes but don’t want to keep buying new ones? About to move house and don’t know what to do with all those old things lying around? Thank you to all those who participated in the Jumbleshare, if you have any more clothes you’d like to donate do drop them in the collection box in the JCR. At 6pm on Wednesday 1st August in SOAS JCR there will be djs, food and loads of clothes to come and swap/buy/take all for a small entrance fee of £3 OR £1 plus 3 items! This will be a chance to have a break from work and spruce up your wardrobe without having to tackle oxford street!! Full details and map on the Facebook page. 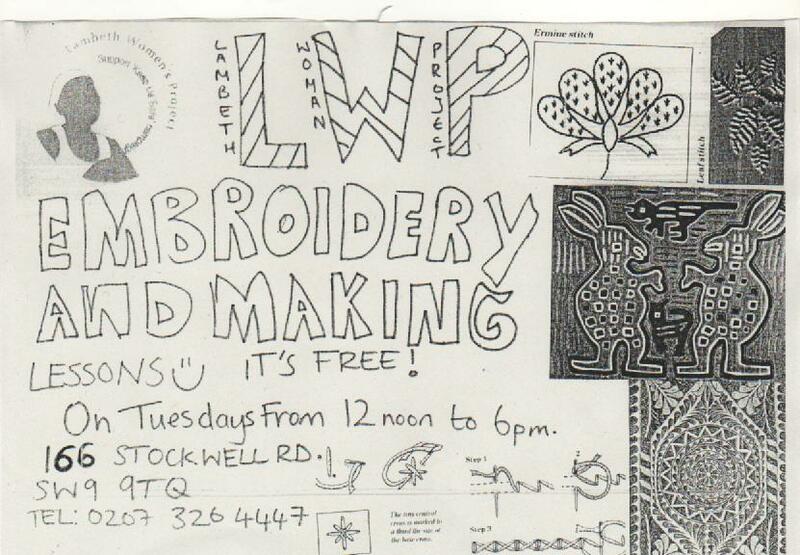 Here’s flyers for two of the regular activities that take place at Lambeth Women’s Project. To keep up to date with the latest activities and events, make sure to keep an eye on the Facebook page. Armpit4August will be running a discussion evening about female body hair and Polycystic Ovary Syndrome (PCOS) at LWP, on Thursday 19th July from 7-9pm. All self-identified women welcome. The organisers from Armpits4August will be giving a short presentation about their campaign and their recent day of action in central London. Armpits4August are asking women to grow out their armpit hair this August to raise money for Polycystic Ovary Syndrome (PCOS) charities. As the campaign aims not only to raise awareness of PCOS but also to create a safe space to discuss women’s complicated, emotional, or embarrassing experiences of body hair, the presentation will be followed by splitting up into small groups for a consciousness-raising (CR) session where these issues can be examined supportively. We will end by coming back together as a group to review the impact of the CR session and how this relates to the role(s) of women in society. Armpits4August is an event for all self-identified women and we hope to host a lively evening of discussion and debate which reflects feminism’s many intersections. 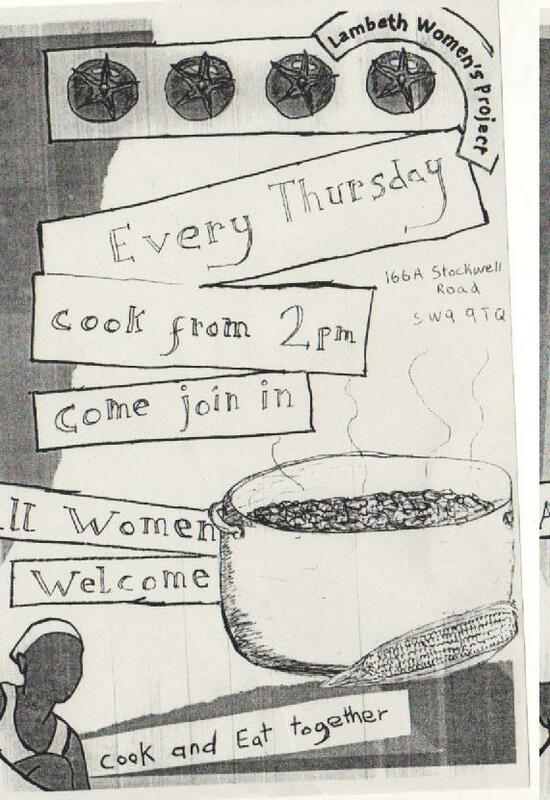 The address of Lambeth Women’s Project is 166a Stockwell Road, London, SW9 9TQ. The ground floor has full disabled access. Contact Zoe for more info!